Our Lanyards include Steel Core Flip Lines, also called Wire Core Flip Lines and adjustable Rope Lanyards. Our Flip Lines are available in 1/2", 5/8" and 3/4" diameters with standard lengths to 15 feet. 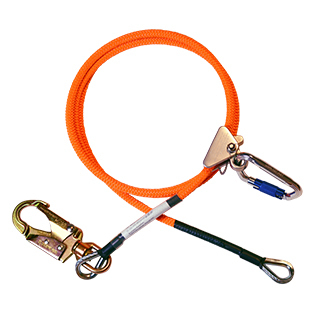 Our MRG, Mini rope grab, also called a rope adjuster, makes a complete Flip Line Kit. Our Adjustable Rope Lanyards are available in an ANSI Z359.3 and Z359.133 for arborists.